You Guys are great, I will definitely buy by you guys again. Force USA, the trusted name in strength equipment, has once again made a high end product accessible to all. 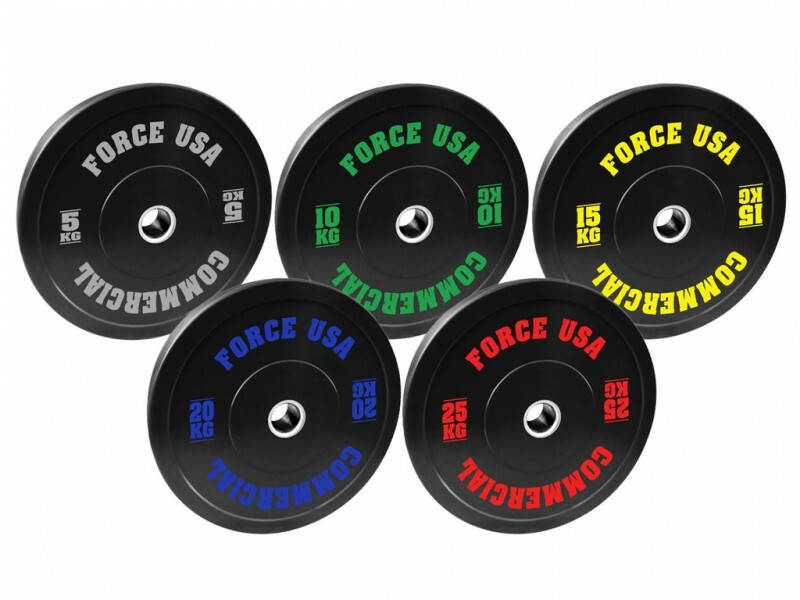 The Force USA range of Ultimate Training Bumper Weight Plates are backed by a comprehensive 2 Year Replacement Warranty* for full commercial usage. Train in confidence regardless if you are starting out lifting at home or using in a busy commercial training facility. Each F-UTBP Force USA Training Bumper Plate is finished with a smooth rubber surface and print markings which display Force USA and the sizing in KG. The colour of the print markings is relevant to IWF size / colour matching so the 10kg plate has Green print, 15kg has Yellow print, 20kg in Blue and Red for the 25kg. IWF colours for print markings helps user awareness of sizing at a distance for rapid selection. As with all great Force USA products, the F-UTBP Ultimate Training Bumper Plates are designed in the USA. Maintenance is key for any piece of gym equipment. Regular maintenance will keep your equipment in prime condition and lasting a lifetime! Weight plates should be checked for moisture, wiped dry and cleaned whenever necessary. Chips, splitting or similar damage is typically a result of misuse or accidental misuse which is not covered under warranty. Bumper plates must be used with a suitable Olympic barbell and high impact absorbing Olympic Lifting platform or VersaFit rubber flooring or BASE rubber flooring in an indoor location. Outdoor usage or usage on an uneven or rigid surface such as concrete or gravel will be considered as misuse and void the warranty. Force USA's obligation under this warranty is limited to repairing or replacing the item at the discretion of Force USA. Warranty is for the original purchaser whom must also retain proof of purchase to verify the item was purchased from an authorised Force USA dealer. Warranty is valid only for the original owner and is not transferable. If your F-UTBP or F-PGB Bumper Plate item has a manufacturing fault affecting its structural integrity contact our customer service team. They will be happy to assist and run through the claim process. Delivery of the faulty item to the place of purchase is at the expense of the owner. Freight is considered a separate service so approved warranty claims will deem the owner as responsible for any freight expenses incurred in returning the faulty item and also for the replacement to be sent. Force USA warranties do not cover any damage to a product caused by or attributable to freight damage, abuse, misuse, improper or abnormal usage, conjunctive usage with other equipment and applications, repairs or tampering by anyone other than the pre-approved Force USA accredited service dealer or any commitments made by any external warranty. General wear on aesthetic components are not covered by this warranty and will not affect the performance of the product. Force USA can not be held responsible for any damages with respect to financial loss, property loss, installation or removal expenses, loss of enjoyment or usage during repair or replacement periods. If the product is not able to be repaired, Force USA will provide a replacement of comparable performance. The replacement product may be of higher, equal or lower selling price due to technological advances or economic change. We at Force USA take pride in our after sales service. If you have any queries or concerns regarding your Force USA Bumper Weight Plate purchase please contact our friendly customer service team. Bumper Plates are ideal for personal users wanting a heavy duty plate designed to be strong and safe when lifting overhead. These bumper plates will help protect your floor and bar from damage when placing the bar back on the floor. General wear and tear and any misuse is not covered by this warranty. Please note the 5kg bumpers must not be used on their own and are NOT designed to be dropped when on bar unaccompanied by larger sized F-TBP bumper plates. 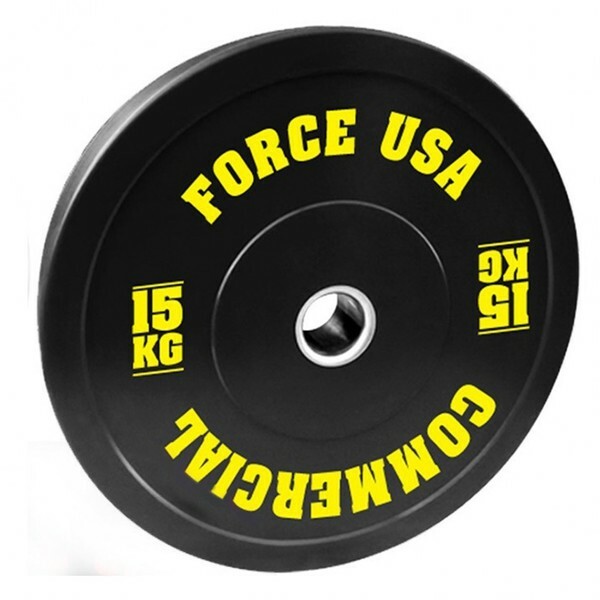 Always ensure larger sizes (10kg and above) Force USA Training Bumper Plates are on the bar at the same time if ever using the 5kg Training Bumper Plates. Dropping the bar from overhead or unevenly will drastically reduce the lifespan of your bumper plates so always practice quality training techniques.